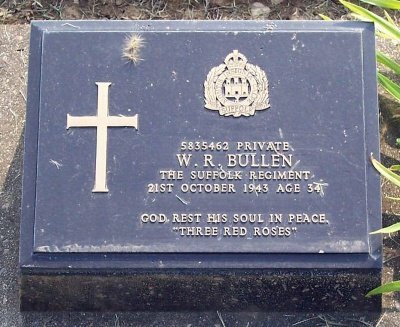 Private 5835462 William Randall Bullen, Suffolk Regiment. Married: Winifred Marguerite Wilkin (1906), no known children. 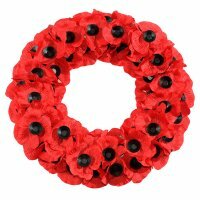 Died: Thursday 21st October 1943, aged 34. How Died: Prisoner of War on the Burma-Siam Railway. Theatre of War: Far East. Medals: War Medal 1939-1945 and the 1939-45 Star. William Randall Bullen was the seventh child of George Bullen (born in Wimpole) and Ellen Bullen, nee Munns, (born in Orwell), and husband to Winifred Marguerite Wilkin (married 1940) of Cambridge. He was brother to Leonard, Olive, Victoria May, Edgar George, Alfred, Sidney, Marjorie and Ruby. In the 1891 Census, William's father George was Head of Household at South[ern] Lodge in Wimpole and his profession was listed as 'Agricultural Labourer'. In the 1911 Census, the family was living at 13 Bridge Street, Whaddon and William Randall Bullen was one year old. The 11th Battalion was lost during the fall of Singapore [February 1942] so it can be assumed William Randall Bullen was captured by the Japanese and became a Prisoner of War at this time. Approximately 620 of the Battalions were taken prisoner and many died later working on the Burma-Siam Railway. Note: William Randall Bullen also appears on the Roll of Honour for the Parish of Cambridge, St Lukes. Cemetery: Kanchanaburi War Cemetery, Thailand. Copyright © The War Graves Photographic Project in asociation with the CWGC. You can buy digital and paper prints of the image above and of 1.7 million other military grave markers in the UK and all over the world. 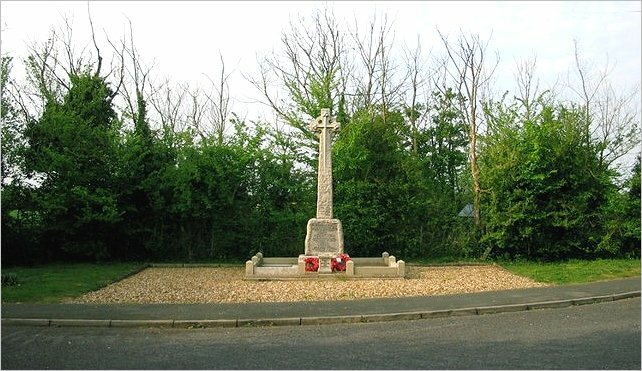 Image © Commonwealth War Graves Commission. Kanchanaburi War Cemetery is 129 kilometres west-north-west of Bangkok in Thailand. It is only a short distance from the site of the former 'Kanburi', the prisoner of war base camp through which most of the prisoners passed on their way to other camps. The Cemetery was created by the Army Graves Service and the graves of those who died during the construction and maintenance of the Burma-Siam railway (except Americans, who were repatriated) have been transferred from the camp burial grounds and solitary sites along the railway into three war cemeteries. 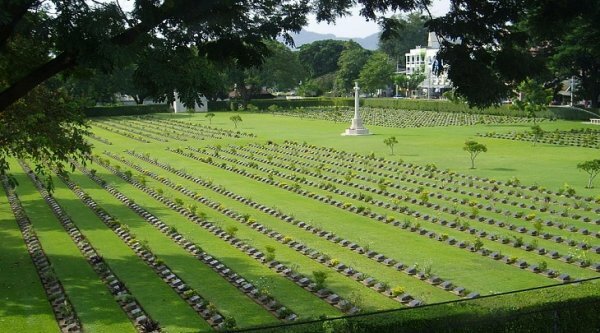 There are now 5,084 Commonwealth casualties of the Second World War buried or commemorated in Kanchanaburi. "The notorious Burma-Siam railway, built by British, Australian, Dutch and American prisoners of war, was a Japanese project inspired by the need for improved communications to maintain the large Japanese Army in Burma. During its construction more than 16,000 prisoners of war died - mainly of sickness, malnutrition and exhaustion - and were buried along the railway. An estimated 80,000 to 100,000 civilians also died in the course of the project. Two labour forces, one based in Siam and the other in Burma worked from opposite ends of the line towards the centre. The Japanese aimed at completing the railway in 14 months and work began in October 1942. The line, 424 kilometres long, was completed by December 1943." William Randall Bullen for this page.